Locate the MT4 Account number which is in the top left hand corner of your MT4 platform. Go to the License Manager page and log in using your unique reference number and ID (Provided by the auto fulfilment system after purchase). Once inside the license management system scroll down to the 'Update/ Register New MT4 Account Details' section (screenshot below). Then enter the MT4 account numbers for each account you want to register on the server. Click the "Update/Register" button to add your MT4 accounts to the system. Your installation will be much easier if you have an up to date version of Java installed on your machine. The installers are available in the License Management Area. Log in using your Ref and ID which were provided in the automated fulfilment email after purchase. Once you have logged in click the 'Generate New Installer Links' button which looks like the image in the screenshot below. TIP: To unzip the contents of zip files you will need a zip utility installed on your machine. There are lots of free zip utlity programs but we like '7Zip' which you can download at http://www.7-zip.org/ free of charge. If you have another zip utility such as WinZip that's perfectly fine to use. 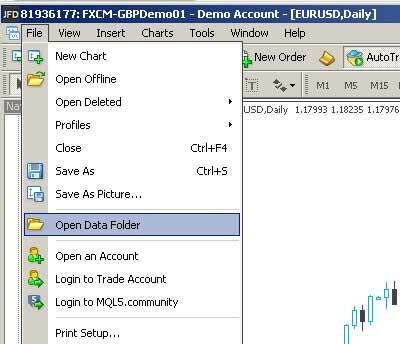 Open MetaTrader 4 - click "File" then "Open Data Folder"
You will see a screen similar to the one above. Right click in the top of the window on the address of the MT4 Data Folder and select 'copy address as text'. Your installation folder will be different to the one shown above. Common mistake: DO NOT point the installation program to your 'EXPERT ADVISORS' or 'INDICATORS' folders. It simply won't work! When Windows UAC (user account control) is active on the machine you have to run the installer twice to target the original MT4 installation folder. 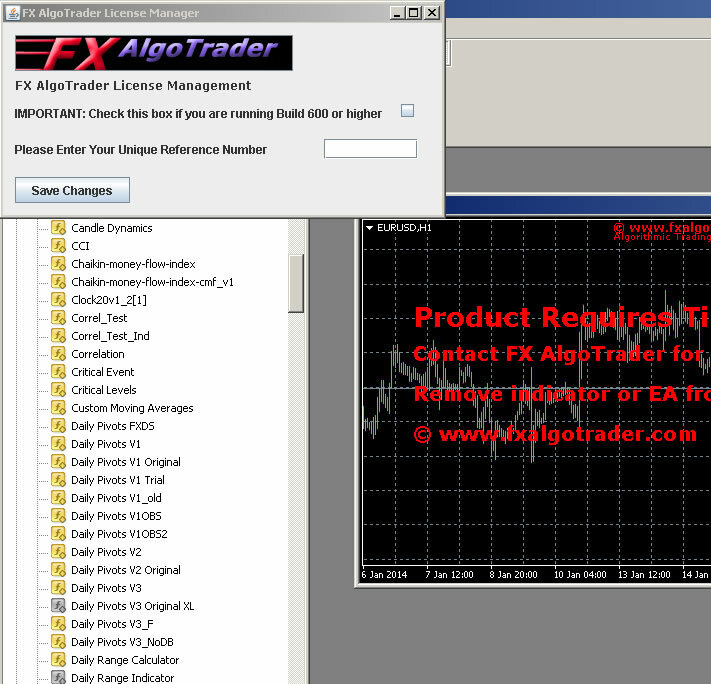 In your MT4 Data Folder you will see a file called 'origin.txt' - if you open this file you will find a file path similar to the screenshot shown below. Copy the file path and re-run the installer using this location. Click and drag your product onto the new chart. 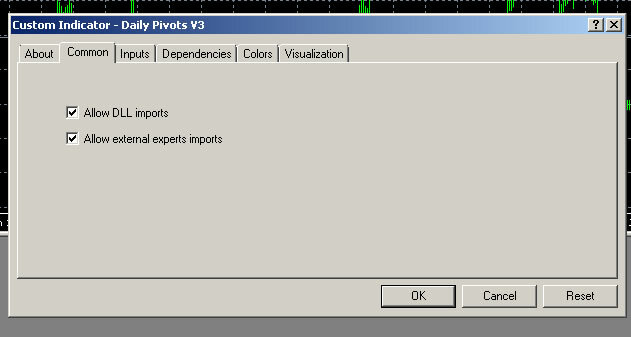 IMPORTANT - When you load the product please select the common tab and tick the 'Allow DLL function calls' and 'Allow external experts imports' checkboxes as shown below. Now enter your unique reference number into the Ref field in the Java utlity. Now press the 'Submit' button. 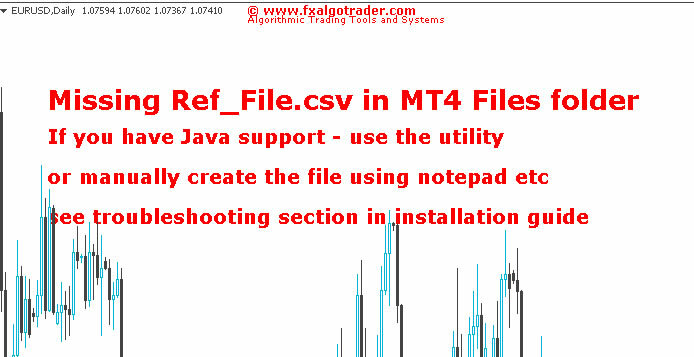 The java license management utility creates a file called 'Ref_File.csv' into your MT4 'Files' folder. 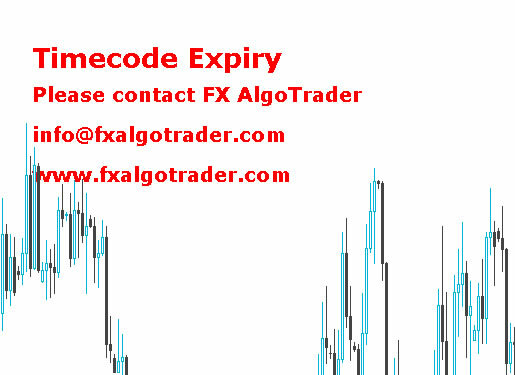 Now just refresh the chart timeframe (toggle between two chart timeframes) and the Timecode Expiry issue will disappear. Cannot Load Test.dll error message in the 'experts' tab in the terminal window. This is most likely due to your machine running Windows UAC (User Account Control) and you haven't performed the 'tandem' installation. Your options are to disable Windows UAC or do a tandem installation where you also install in the physical MT4 root folder. Please refer to Locating MT4 Installation Location(s) and pay particular attention to the section at the bottom regarding the long alphanumeric code. This is a very clear signal that Windows UAC has virtualized your MT4 data folder. If you have a problem we need detailed information...... an email saying "It doesn't work" is not helpful!